Theodore Flowerman, 94, a bassist who also played piano and tuba during his career, died on May 14. 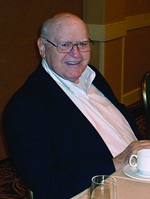 He had been a Local 802 member since 1937. Mr. Flowerman started his career with club dates in the Catskills, where he played piano and bass. Later, during World War II, he played tuba in an Army marching band. One of his big breaks came next, when he won the bass chair with the Ballet Russe de Monte Carlo. He later served as principal bassist — and librarian – of the New York City Ballet. Mr. Flowerman was also a member of the New York City Opera for 15 years. When his ballet and opera ensembles were in the off season, Mr. Flowerman performed with symphony orchestras, such as with the New York City Symphony under Leonard Bernstein. He also particpated in recordings. Besides Neal, Mr. Flowerman is survived by his other son, Martin, who played bass with the Cleveland Orchestra for 44 years until retiring in 2011. Mr. Flowerman is also survived by Neal’s wife Susan, Martin’s wife Barbara, two grandchildren and one great-grandson. Aaron Sachs, 90, a saxophonist and clarinetist and a member of Local 802 since 1940, died on June 5. Mr. Sachs started as a young protégé of Benny Goodman, later played with Red Norvo and Earl Hines, and eventually recorded and toured as a leader in his own right. As his career took off, Mr. Sachs gained more prominence, and Esquire magazine awarded him its “new star” award in 1947. During his career, Mr. Sachs recorded with Sarah Vaughan (on her first session ever), Stan Getz, Chet Baker, Billie Holiday, Gene Krupa, Anita O’Day, Cozy Cole and many others. In the 1960s, Mr. Sachs began a serious investigation of Latin music, which culminated in his collaborations with the greats of the genre, including Machito, Tito Puente and Tito Rodriguez, for whom he wrote the hit “El Mundo De Las Locas.” (The same song was also recorded under the title “Blast Off” for drum legend Louis Bellson.) Mr. Sachs also co-wrote “Twist Changa” for Machito and Henry Glover during the twist dance craze. After a long and illustrious career, Mr. Sachs remained on the scene even in the last decade of his life. 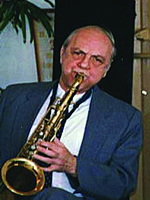 A musical tribute to him took place in 2006 at Lehman College, featuring a performance by the university big band. In 2010, he played shows at the Rye Playland amusement park. He is survived by his wife Phyllis, sister Trudy, son Allan and several nieces and nephews. *As Allegro went to press, colleagues of Mr. Nadien were planning a feature about his life that will be published in a subsequent issue.